Peel and thinly slice enough shallots to measure ¼ cup [½ cup]. Pat the fish dry with a paper towel; season the sole or trout lightly with salt and pepper, the halibut generously. Lay the parchment paper sheets side by side. Divide the shallots and spinach between the 2  sheets and season with salt and pepper. Top with the fish and lemon slices and drizzle each with 1 teaspoon oil. Working with 1 sheet at a time, bring 2 opposite sides of the parchment to the center and fold them together several times to create a tight seam. Fold up each end to form a tight seal. Place the packets on a sheet pan, sealed sides up, and bake until the parchment is puffed and browned and the fish is tender when pierced with a skewer or sharp knife, 12 to 15 minutes. While the fish bakes, prepare the salad. Thinly slice the dried apricots. In a medium frying pan over medium heat, warm 2 to 4 teaspoons oil until hot but not smoking. Add the apricots, dates, and almonds and cook, stirring occasionally, until just warmed through, 2 to 3 minutes. Remove from the heat and stir in the parsley, sumac, lemon zest, and 1 tablespoon [2 TBL] lemon juice. Season to taste with salt and pepper. Open the fish packets, being careful of any venting steam, and transfer to individual plates. Spoon the date and apricot salad on top and serve. 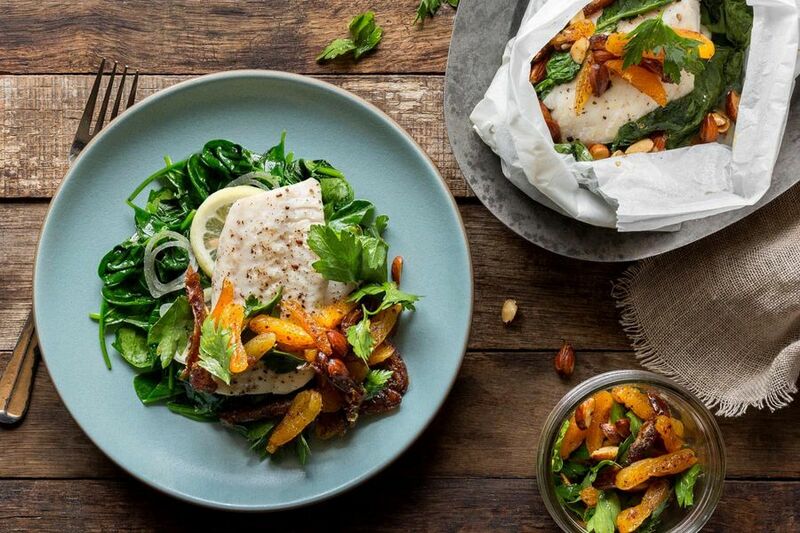 Unwrap North African–inspired flavor with our parchment-steamed fish fillets, a heart-healthy paleo meal that’s packed with lean protein and good fats. Use just 1 teaspoon [2 tsp] oil when preparing the warm salad in Step 4 to shave off 20 calories and 2.5 grams of fat per serving. A citrusy spice popular in Middle Eastern cooking, sumac is made from the dried berries of the sumac shrub and is prized for its tartness. We love to use it on anything we might season with a squeeze of lemon. Calories: 540, Protein: 25g (50% DV), Fiber: 11g (44% DV), Total Fat: 18g (28% DV), Monounsaturated Fat: 12g, Polyunsaturated Fat: 3g, Saturated Fat: 2g (10% DV), Cholesterol: 65mg (22% DV), Sodium: 480mg (20% DV), Carbohydrates: 72g (24% DV), Total Sugars: 47g, Added Sugars: 0g (0% DV).